The facilities were nice, you have several places to chill outside your room. The location is basically the best for this price, you're literally 10min walking for the beach, close to a supermarket and several shops. Staff was friendly, they let me print my boarding pass. Breakfast was great! Lots of fruits and buffet type. Social spaces were frequently used at the hostel and there were many activities. Stayed here a night before and after Providencia Island. It was fine, big spacious dorms and really really friendly reception ladies! Really good location, only a short walk from the main beach and all the restaurants, shops, bars etc along there. Staff was friendly and helpful. Air conditioning worked well. The hostel was fine. I only spent a night so I can't speak too much but it's nothing special. Very nice staff, very playful and jolly. I would definitely go back again. I love it. Nothing. The building is really old and uncomfortable. Is far from the beach and the staff is unkind. One of our best sellers in San Andrés! 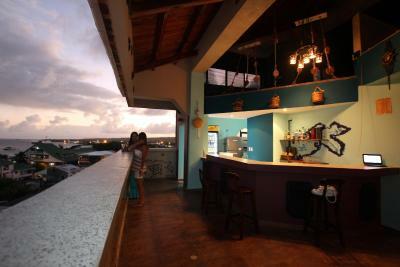 Just a 5-minute walk from the beach and the Sea of the 7 Colors, San Andrés Hostel has rooms with air conditioning. There is an on-site disco bar. Scuba diving lessons are available. 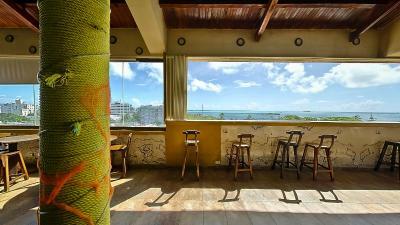 El Viajero San Andrés Hostel has rooms with air conditioning and private bathrooms. Double and twin rooms have flat-screen cable TVs. All rooms feature colorful regional motifs, dark wood furniture and bright bedspreads. 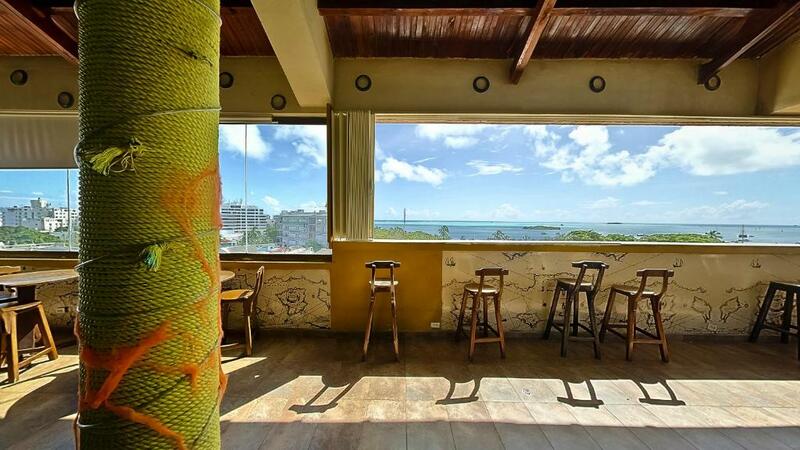 A buffet breakfast with world famous Colombian coffee can be enjoyed at the bar. El Viajero is a 5-minute walk from Sea Flower Biosphere Reserve and bicycle, golf cars and scooters rental can be arranged. Guests can also practice windsurfing, jet ski, golf, kite surfing and snorkeling. 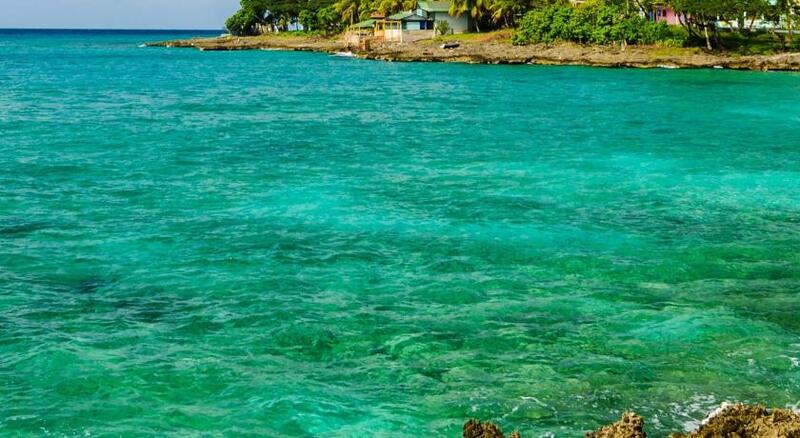 San Andres Airport is a 10-minute walk away. 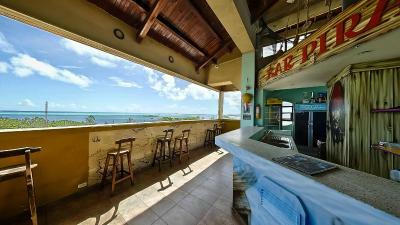 뀐 Located in the top-rated area in San Andrés, this property has an excellent location score of 8.2! 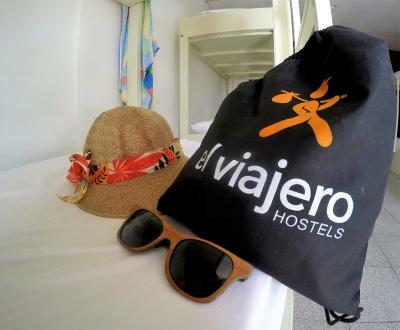 When would you like to stay at Viajero San Andres Hostel? An air-conditioned room featuring regional décor, free Wi-Fi, flat-screen cable TV, a safe box and a private bathroom. An air-conditioned room featuring regional décor, free Wi-Fi and a shared bathroom inside the room. 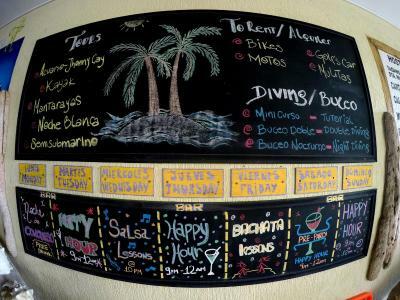 House Rules Viajero San Andres Hostel takes special requests – add in the next step! 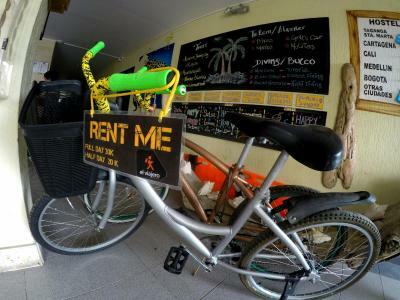 Viajero San Andres Hostel accepts these cards and reserves the right to temporarily hold an amount prior to arrival. Please be informed that the desired type of bedding must be specified at the time of confirming the booking. Please note groups can be accommodated in the same dormitory, inform the property in advance, this is subject to availability. The breakfast is good. You go upstairs and there's a toasted sandwich maker, bread, fruit and juice. Again, the staff member with long hair needs to get a mention because of how beautiful she was. Great place to meet travellers. Location is still quite a walk away from everything. Area doesn't seem too safe at night. Breakfast got worse each day. First day there were boiled eggs, ham, and cheese. Next day there were no eggs and was not replaced with anything else. Day after there was also no eggs and now no cheese. Never cold milk for cereal. Was a shame. Evenings in the bar were never as pictured on booking. 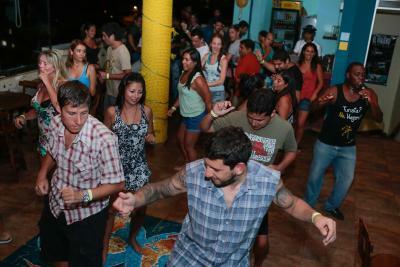 Events such as salsa and Bachata night did not seem like they went ahead. Went to the bar at 10:30 pm and there was just one person sitting and having a drink. A very small amount of people gathered later on but there was no dancing. Room is boiling hot throughout the day because air-conditioning is only turned on from 7-11 pm. Don't expect a comfortable afternoon nap after your activities. Bathrooms are extremely dirty. And only one shared between 8 people in the room.. expect to wait for 3 hours if you want to shower after 4pm. There's only one other bathroom you can use down near reception. So wear a diaper just incase you need to pee. Water is freezing cold. Wifi is horrible. Despite the disappointing food options, the atmosphere was great for breakfast. Easy to meet others and enjoy. It's nice that you can borrow the shoes for the water but you need to ask for them because no one will tell you that you can borrow them. The lamps by the bunkers seem like a good idea, except that there isn't a curtain for it so if one guest would turn it on, it would light most of the room. Also, the breakfast is quite poor. You would expect more fresh fruit and the juice to be natural. Almost everything!!! IS TOO EXPENSIVE FOR A TERRIBLE SERVICE!!!! In my first day I was in a room in a bed above. The stair wasn't fixed and always when I tried to get up it used to shake and make a lot of noise. It wasn't safe at all! The toilets are inside the rooms. It's good but there's just one unique common toilet in all the hostel in the reception! If we are in 5th floor we need to get down to the reception just to go to the toilet when in our room is ocupied. There's nothing in the rooms to hang our things to dry. My friend had a huge problem there. She was in a mixed room with 8 beds. After one day there they put 7 men in the room with her. They were rude, making a lot of noise in the middle of the night, getting drunk... when she complained at the reception the staff wasn't helpful at all! She needed to sleep one night at the reception. THEY ALLOW PEOPLE TO BE STUPID AND DISRESPECTFUL WITH OTHER GUESTS INSTEAD ASK STUPID PEOPLE TO GET OUT OF THE HOSTEL! The water in the shower is cold. The city is hot but not enough to warm the water. The water in the shower is really cold there! The breakfast and location. A part of the staff is nice. Not everyone. the room and hostal was clean. the location is good. and i guess if you are there to party and meet people it's perfect. breakfast was better than expected. Everything, location is great. Staff is tremendously helpful always smiling. cool and young environment. lovely staff. No potable water in shower or bathroom. Curtains were not enough to avoid sunburns. There was sewer smell coming from the bathroom. No hot water. Sorry, but this was not the hostel for me. The ratings drew me in as everyone seems to love it. But unless you want to party non stop and never sleep, look elsewhere. The doors may as well not be there as the halls are very echoey so noise travels and unfortunately the kind of people staying here are inconsiderate party animals who dont understand backpacking courtesies in dorms. The staff were lovely. And I was able to get refunded my last 2 nights when I needed to leave in order to get any sleep. The bathroom was grubby and the toilet didn’t work very well. Staff members of this hostel have been the most rude, unfriendly and careless I’ve ever seen. The service was horrible, people staying there were the worse kind. Nothing. It was a total disappointment. I’ve been in other Viajero’s in Colombia and Uruguay and this was my worst experience. The staff just don’t care, there was no water, but the worst thing that I have found with viajeros so far is that there is just no soul.